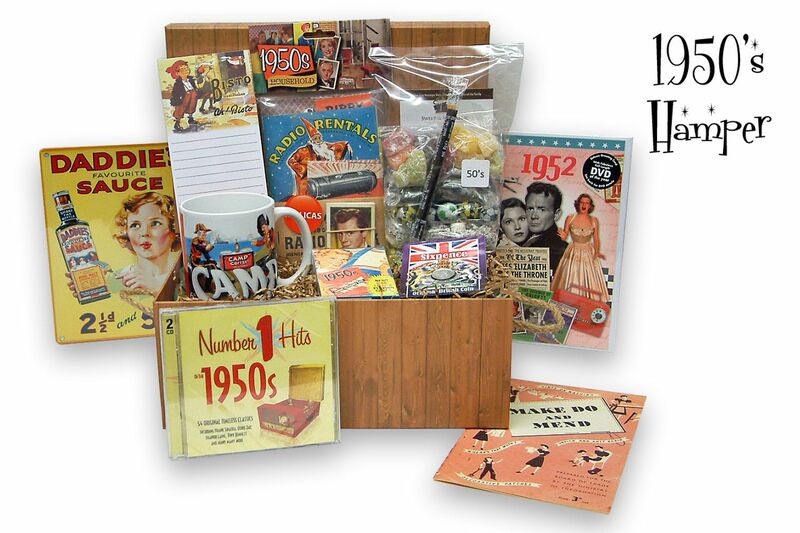 30% OFF RRP..Remember the 1950's with this 'design yourself' Hamper. Packed with gifts that bring back memories of your childhood years. Hamper includes as Standard - 50's Sweet Pack, Coronation of Queen Replica Newspaper, 50's double music CD, EII Coin, plus items your can choose from our drop down boxes ..Great gift idea for a 60th or 70th Birthday or special occasion. You will not find this Hamper anywhere else on the Web ! Made up exclusively by Sweet and Nostalgic it comes packed full of 1950's Nostalgic Gifts, this unique hamper is the perfect gift for that special occasion, and perfect for a 60th Birthday Gifts or 70th Birthday Present. Jelly Babies, Chocolate Footballs, Bulls Eyes and more..
- A Nostalgic Double Music CD featuring many of the emotive songs from the 1950's (54 Songs). - Choose one of our Nostalgic Metal Wall Signs (A5 size) from the drop down meu. 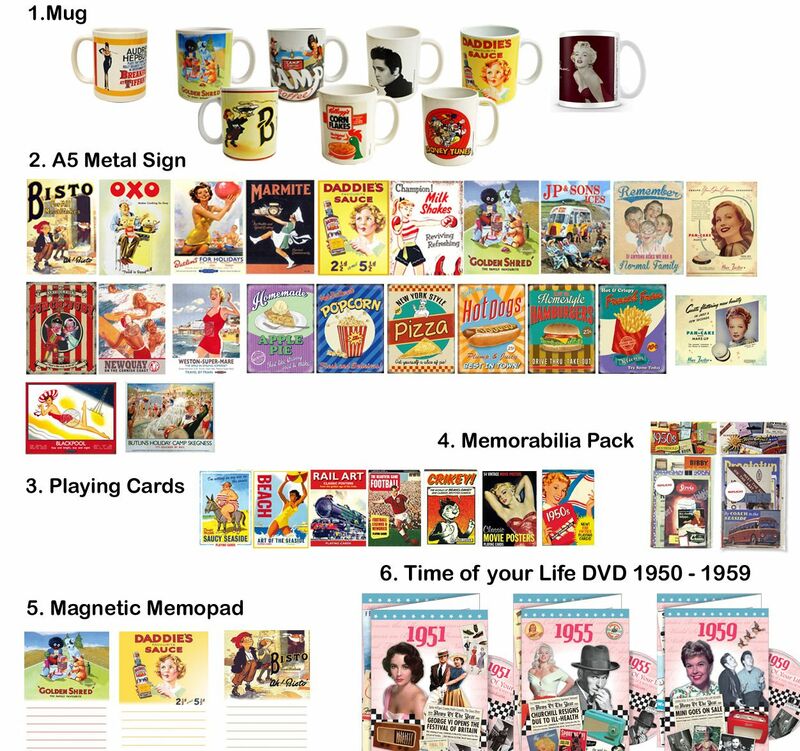 - Choose one of our fantastic Memorabilia Packs from the 1950's. All of these goodies are packed into one of our Luxury Hand Made Wicker Hampers. Whew !...and...On top of all of this we can even add a gift message for your recipient and drop ship it direct to the special person (choose alternative delivery address through the checkout). Remember the 1940's with this 'design yourself' Hamper. Packed with gifts that bring back memories of your childhood years. Hamper includes as Standard - 40's Sweet Pack, WWII 6CD set, WWII Coin, WWII miniature Medal, various printed memorabilia plus items your can choose from our drop down boxes ..Great gift idea for a 70th or 80th Birthday or special occasion. 30% OFF RRP..Remember the Swinging 60's with this 'design yourself' Hamper. Packed with gifts that bring back memories of your childhood years. Hamper includes as Standard - 60's Sweet Pack, 1960's Double CD, 1960's dated Coin, 'With It' replica magazine, plus items your can choose from our drop down boxes ..Great gift idea for a 50th or 60th Birthday or special occasion. 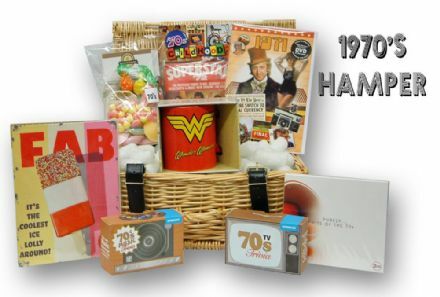 30% OFF RRP..Remember the 1970's with this Funky Retro Hamper. Packed with gifts that bring back memories of your childhood years. Comes filled as standard with a 1970's Retro Sweet Pack, 1970's Childhood Memorabilia Pack, a Double 1970's Music CD, 2 x 70's Trivia Card Games, plus a section of items that you can choose yourself to make this a unique 40th Birthday Gift or 50th Birthday Present. 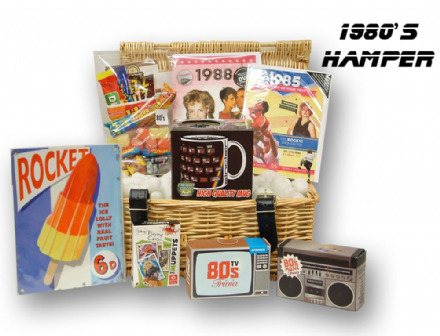 30% OFF RRP..Remember the 1980's with this Funky Retro Hamper. Packed with gifts that bring back memories of your childhood years. Comes filled as standard with a 1980's Retro Sweet Pack, 2 x 80's Trivia Card Games, plus a section of items that you can choose yourself to make this a unique 30th Birthday Gift or 40th Birthday Present.